MECART manufactures its modular panels in its own plant under ISO 9001 Quality Assurance System. Manufacturing our panels in the controlled environment of our factory enables us to produce and guarantee quality and on-time delivery. We do not depend on third party suppliers. The panels are pre-engineered and prefabricated in the factory with mechanical and electrical utilities, openings and any other utilities already wired inside the cavity of the wall and ceiling panels. No errors are possible since the approved drawings go directly to the numerical cutting machine which prevents mistakes in the positioning of utilities and hatches. Since we design, engineer and manufacture everything ourselves, we have the knowledge, ability, and tools to build the modular buildings, enclosures, screens or panels that meet your needs. Our high capacity plant and high-efficiency production line is able to achieve short production lead times. With modular construction, better upfront planning is done during design and engineering which reduces errors on site. No subcontractor scheduling delays with our factory engineered utility ready panels. 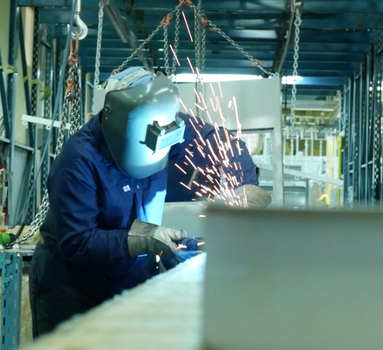 With our in-plant manufacturing, multiple pieces can be fabricated simultaneously to reduce lead time. Prefabricating modular buildings and acoustic panels in the controlled manufacturing environment of our plant ensures consistent quality of our panels. Our experienced crew completes multiple quality checks throughout the entire manufacturing process in which most components are built using precise machine equipment to ensure conformity. Before shipping the prefab building, prefab panels, acoustic doors or any other systems, we always perform a quality check, by preassembling or testing it. We make sure everything is working as specified in the design before shipping the products.